The Lobster Elite Freedom is equipped with features that are not found on any machine in its price range. The large ball capacity and battery size allow extended play on the court. The freedom's oversize wheels and extended handle provides unequaled portability for players who are on the move. 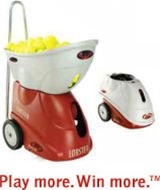 Enjoy playing against such advanced features such as full corner-to-corner random oscillation, up to 50-degree lobs to practice your overheads, and speeds of up to 70 miles per hour. Designed for maximum durability, its 35-pound ergonomic design and oversize wheels allow for easy transport, even with afull hopper of 150 balls. A 2-4 hour battery allows you the freedom to play anywhere at anytime.